You’re welcome, Agata, and good hunting! Another view from Ginza 4-chome looking towards Kyobashi. The high elevation affords a clear view over Tokyo. Ginza’s celebrated willow trees are still very small on this image, but there are already horse-drawn streetcars. These started operations on June 25, 1882 (Meiji 15) and ran through 1904 (Meiji 37). That suggests that this photo was taken during the 1880s, or perhaps the 1890s. The building with the small clock tower on the right is the Ginza Branch of the Kyoya Watch Shop (京屋時計店の銀座支店時計塔). It was for many years the symbol of Ginza and appears in many a nishiki-e (woodblock prints). It was located on Ginza 4-chome, which at the time was seen as the end of Ginza Avenue. For more information and another photo of this exact same location, albeit photographed from street level, see Tokyo 1880s • Ginza Streetcar. 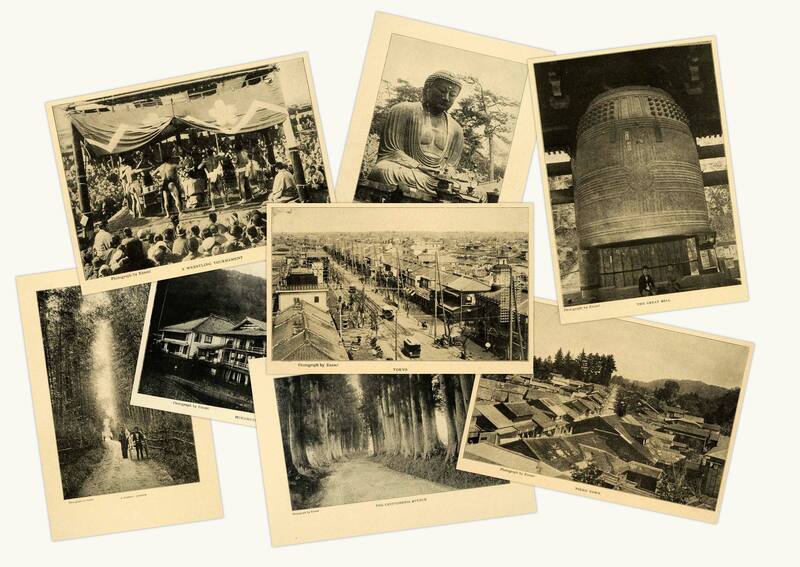 For more information about Ginza, see Tokyo 1890s • Shinbashi Bridge, Ginza. This image is generally attributed to Kozaburo Tamamura, but I recently found a print that stated Photograph by Enami. You can also licence this image online: 80717-0021 @ MeijiShowa.com. Great shot. I love the angle of the photo and that you can see such a long line of pylons (not sure if that’s the right term). Btw. I wanted to ask if you can recommend any book that deals with meiji era sea bathing culture. I wanted to write an article about meiji swimsuit fashion but I still lack reliable information. Hi Agata, I haven’t yet seen an English language book on Meiji era sea bathing culture, and have never searched for a Japanese language one. I have run into passages though in other books, although I can’t remember which ones. If you haven’t done so already, I suggest that you check 1) the National Diet Library, 2) NACSIS and 3) the book A Collector’s Guide to Books on Japan in English: An Annotated List of Over 2500 Titles with Subject Index, ISBN 9781873410912. Doesn’t this date seem early for there to be powerlines? New York had its first lines in 1881. 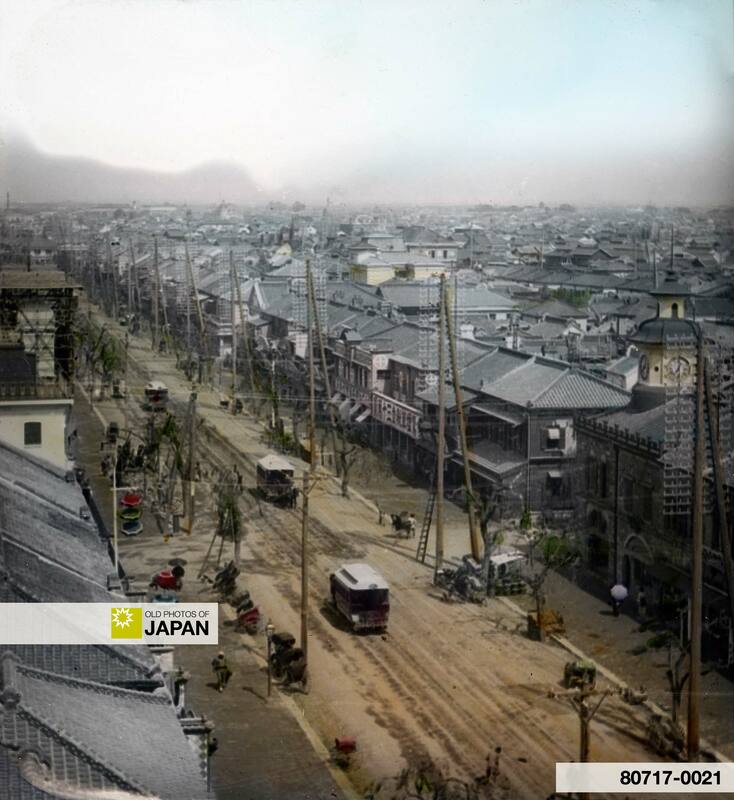 Tokyo Electric Lighting began supplying electricity to the public in 1887. Tokyo’s horse-drawn streetcars ran between 1882 and 1904. Assuming that these are indeed power lines, it is indeed possible that this photo could have been taken later, during the 1890s, as well.